A full-on documentary day. Meetings with distributors; and emails and texts galore. Watched Errol Morris’ Tabloid – there are not that many documentary film-makers whose name alone makes me want to see whatever they do. Morris, however, is one. Tabloid doesn’t disappoint – great style, entertaining and interesting – although I have to say I’m left at the end slightly unsure of Morris’ attitude to the story. Then went to a HBO-hosted event for the Docuweek Showcase. It seemed to be a clever mix of opening event and excuse to show one of their own films that isn’t in the Showcase. Marathon Boy is about that little Indian kid we all gawped at a few years back when he ran 42 miles. Very nicely made film, albeit half an hour too long. I won’t give much away but the film has many good moments and some shocks too. I was, however, left with rather too many questions. Still, the film-maker really must have worked hard and I hope the film does well for her. At the event tonight there were something like 200 folk, just to show once again how competitive the doc world is now. So it’s such a bunfight what films do well and which don’t – plus the importance of contacts, publicity budget and what-not… A few observations from this event too: 1: I listened in to three conversations. Each was exactly the same. Person one says ‘I …’ the second person listens for a pause and then says ‘I..’ and so it goes on. Not one of those people asked a question of the other! 2: at any one time there were 30 people on mobiles. No-one feels able to stand for a second on their own. 3: I overheard a woman discussing her forthcoming $65,000 food and beverage bill for her wedding. She can’t have been a documentary film-maker. 4: the Time Warner building has a great view over Central Park, reminding you that this has to be the most exciting city in the world. 5: I hope one day Mir gets to visit. Back at the hotel, the all-important New York Times review comes in…bit so-so I have to say. The reviewer loved The Boy who Plays on the Buddhas of Bamiyan and thinks the long span of time for the new film makes it a little patchy. Which it is…but you don’t want to sit and watch a three-hour film. 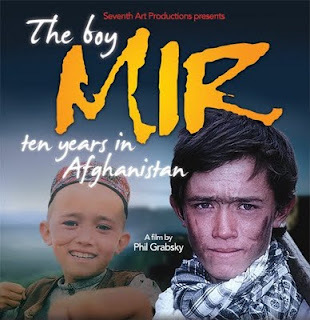 Luckily on Rotten Tomatoes they mark it down as a positive review with the summary: ‘If you’ve seen the first film, you’ll want to come back to see Mir’s progress through life. And no matter what happens, it seems, the smile remains.’ Also Jules Brenner on Filmcritic.com writes a great review whose summary is ‘Conveys an understanding of Afghan culture better than anything we’ve seen yet. Well worth its ninety minute screen time, and a lot more.’.